Hello, Mama Elephant friends! 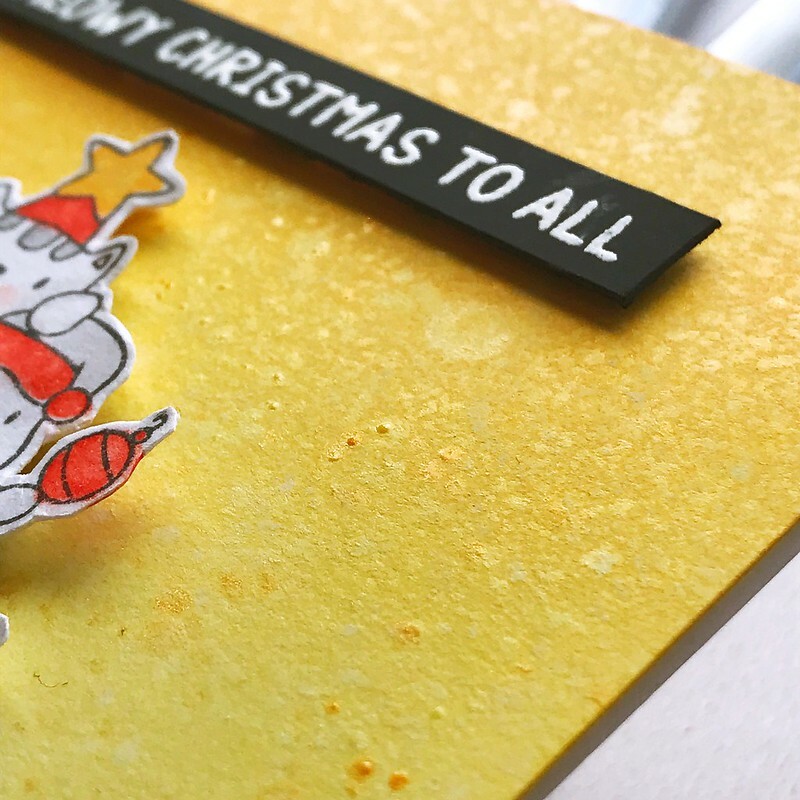 It’s Rubeena here and I’m so happy to be guest designing here on the Mama Elephant blog! Wasn’t the last release amazing?! I know many who have splurged on the release, and if you haven’t purchased yet, what are you waiting for? 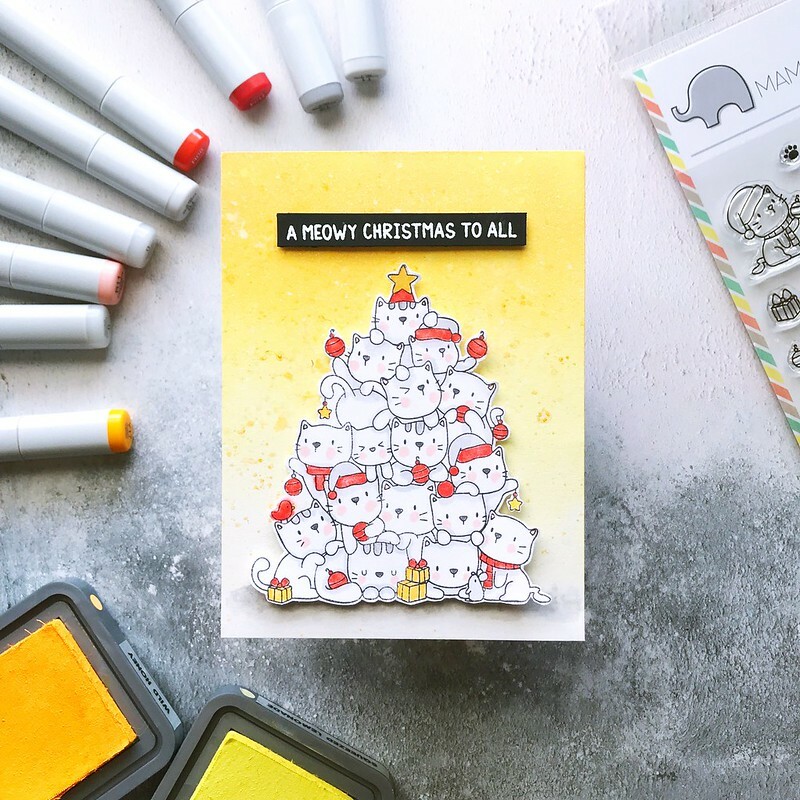 I used my favorite set, Oh Kitty Tree for today’s card. I have two cats who are just over a year old so I’m officially a crazy cat lady. I have to have all the cat stamps! 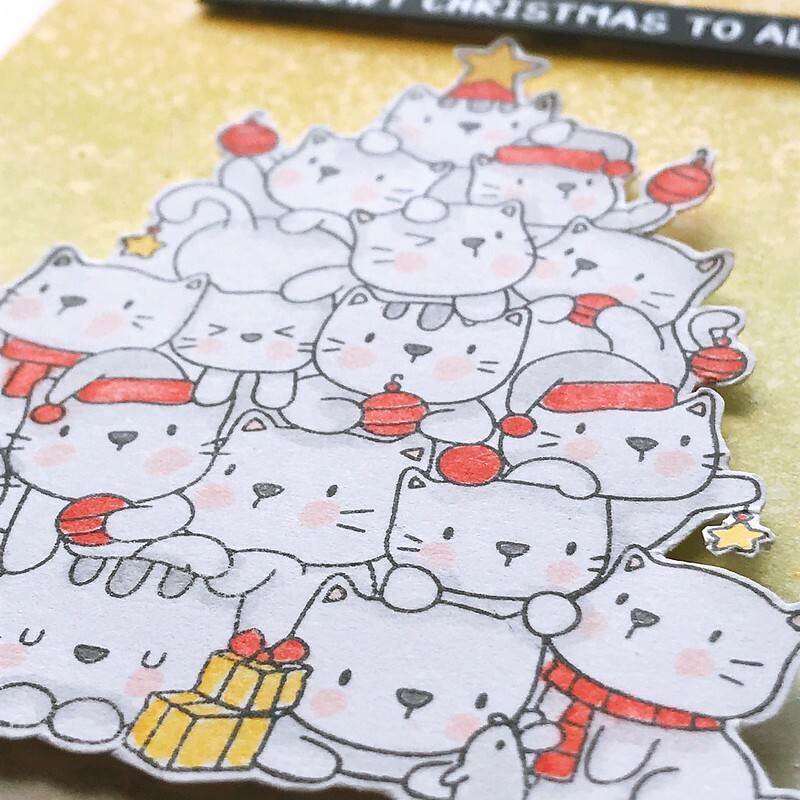 I started by stamping the large image from Oh Kitty Tree with black dye ink on smooth white cardstock. 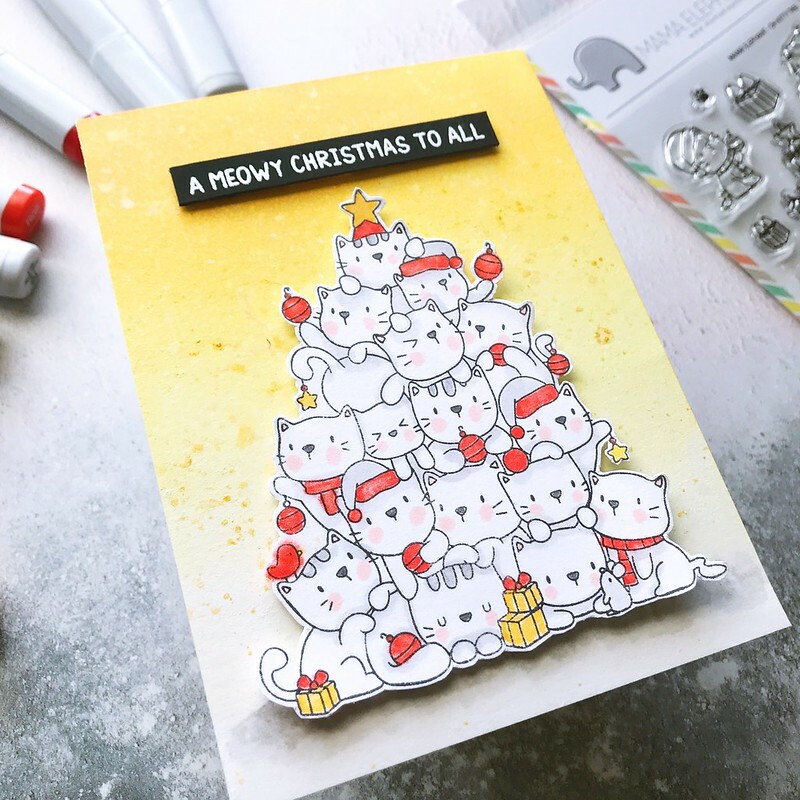 I love how this crowd of cats create a focal point for a card so you don’t have to do much else. I did very basic coloring with gray, yellow and red Copic markers. With a limited color palette, I don’t have to overwhelm myself. Seriously though, the Mama Elephant design team has done wonders with this stamp. I would highly recommend checking out their work featured on this blog and on social media! I cut the image and set it aside. For my background, I did some ink blending with two yellow inks and left some white space. I added splatters using white, gold, and iridescent ink sprays. 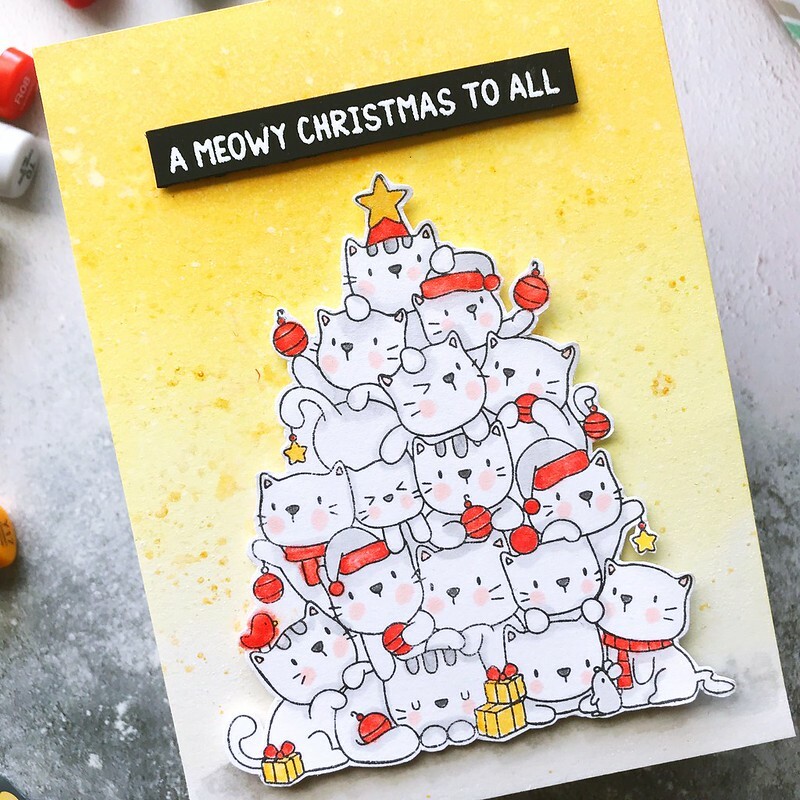 While that was drying, I stamped the sentiment “a meow Christmas to all” from Oh Kitty Tree with embossing ink on black cardstock and heat-embossed with white embossing powder. I trimmed it down as a label. I adhered the blended panel to my card base with double-sided adhesive. Then I mounted the kitty tree image and sentiment over it with foam tape. To finish the look, I added some gray shading below the cats so they don’t look like they’re floating. 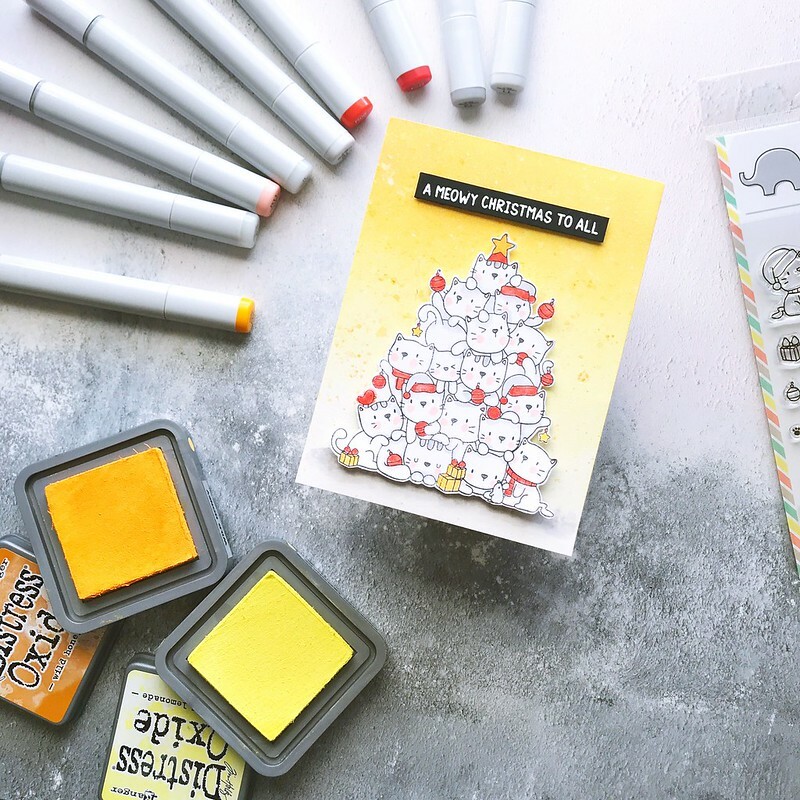 I hope you are inspired to start making holiday cards. Thanks so much for stopping by and to Mama Elephant for having me! great basic colour palette!! gorgeous!!! Precious! I wiah you had demoed how to do the fading background.